Many of us who work in the interface of Cancer Clinical Research and Biomedical informatics were thrilled to hear about the cancer moonshot program from President Obama announced in his final State of the Union Address on Tuesday, Jan 12’16. VP Biden, the nominated leader for this effort, has pledged to increase the resources available to combat the disease, and to find ways for the cancer community to work together and share information, the operative word being “share” (after ‘resources’). 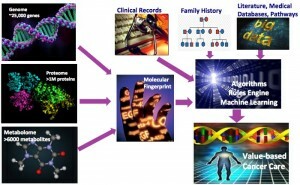 In this post, I briefly review (by no means comprehensive; just a Saturday morning project while brunch cooks in the Instant pot) four thematic areas where informatics is already playing a key role to help realize cancer moonshot goals and identify challenges and opportunities. Immunotherapies: Recent approvals of ipilimumab (Yervoy), sipuleucel-T (Provenge), Nivolmab (Opdivo) and Pembrolizumab (Keytruda) represent important clinical advances for the field of active immunotherapy in oncology and for patients with melanoma and prostate cancer, respectively. Immunoinformatics has played a critical role in B- and T- cell epitope prediction during the course of development of these therapies. New predictive computational models to describe the time-dependent relationships of cancer, immunity, and immunotherapies have emerged over the last few years. Using next gen sequencing approaches such as whole genome, exome and RNA sequencing, it is now possible to characterize with high accuracy the individual set of Human Lymphocyte Antigen (HLA) alleles of an individual patient leading to personalized immunotherapies. The biggest challenge in immunoinformatics arises from the routine sequencing of individual human genomes. We need new informatics tools to study the impact of natural genomic variation on the immune system and how to tap into it for new therapies. Click here for further reading. Precision medicine: President Obama’s precision medicine initiative and the $215M investment have brought precision medicine to the forefront of many organizations. The cost of cancer care is estimated at $200 Billion each year and only on the rise as our population increases and lives longer. Many pundits see Precision Medicine as a way to deliver value-based cancer care. Thanks to high throughput technology, including genomic testing of each tumor, and each patient’s inherited DNA— along with proteomics in the future—oncologists are able to tailor regimens for gene mutations in each patient thus avoiding high cost of drugs that may not work. A key informatics challenge is to figure out which of the thousands of mutations in a patient’s tumor are drivers or actionable markers. There is a race in both academic and commercial space to develop software that will tease out the ‘drivers’ from the ‘passengers’. Furthermore, mutations have to be categorized by levels of evidence: high evidence – where the gene mutation has been tested in a randomized controlled trial (RCT) setting, medium evidence – retrospective gene mutation analysis of RCTs- and finally low level evidence with pre-clinical data only on the mutation. We need better evidence modeling approaches to categorize actionable mutations if clinicians are to use these in routine patient care. Click here for further reading. Cell free DNA/blood tests: While molecular profiling in solid tumors remains routine practice in cancer diagnostics, modern technologies have enabled detection of biomarkers in stray cells, exosomes and traces of DNA in blood and other body fluids. This offers a low cost method to obtain cancer-profiling data for diagnosis and treatment when invasive tissue biopsies may be clinically difficult. While technologies and informatics methods for detecting very small amounts of tumor DNA are on the rise, there are many biological issues that need to be addressed. If the tumor cell did not shed a single piece of variant DNA, even the most sensitive technology will be unable to detect it. Commercial interest in this space is enormous. The Genomics/Informatics Company Illumina has just launched a new startup, GRAIL, in collaboration with Jeff Bezos and Bill Gates to develop a single blood test that could detect cancer early. Now, that is a moonshot goal! Click here for further reading. Organizing cancer data: Now on to my favorite topic of organizing cancer data to power new discovery. Secondary use of EHR data for observational studies is improving through clinical research networks. As large biorepositories linked to electronic health records become more common, informatics is enabling researchers to identify cohorts that meet study criteria and have requisite consents. While there have been significant efforts in sharing molecular data sets publicly, less progress has been made on sharing healthcare data. Many standards exist today to facilitate data sharing and interoperability. We need more training of existing standards to consumers (app developers, scientists) of standards. We also need a comprehensive knowledgebase ecosystem that supports federated queries across cancer subtypes, risk, molecular features, diagnosis, therapy and outcomes at an individual level to advance biomarker discovery and better clinical decision support. Real-world Big Data on claims, outcomes, drug labels, research publications, clinical trials are now available and ready to be linked and analyzed to develop better cancer treatments. NCI’s TCGA and Rembrandt, Georgetown Lombardi Cancer Center’s G-DOC, Global Alliance for Genomic Health (GA4GH), ASCO’s CancerLinQ are all efforts in this direction. Let’s unleash cancer big data in effective ways to collectively make the moonshot program a reality! Click here for further reading. Programs such as the cancer moonshot are a journey, not a destination and if directed appropriately, can inevitably better the practice of cancer medicine.